Morning After Breakfast Visit see local Manali like Hidimba temple, Manu temple ,Vashisht Bath, Van Vihar see run way side seen Manali is situated near the end of the valley on the National Highway leading to Leh. The landscape here is breath taking. One sees well-defined snow capped peaks, the Beas river with its clear water meanders through the town. On the other side are Deodar and pine trees, tiny fields and fruit orchards. 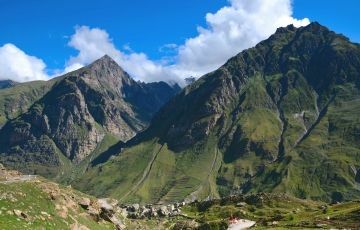 It is an excellent place for a holiday, a favorite resort for trekkers to Lahaul, Spiti, Bara Bhangal, and Zanskar ranges. Night Manali. Morning move to Rohtang pass, gateway to Lahaul-Spiti valley. It affords a wide panoramic view of the mountains. Here one sees the majesty of the mountains at its height and splendour. At the top of the pass the air seems to glitter against the snow as you look down over herringboned ridges into the Lahaul valley. Rohtang pass and enjoy the height. Morning After Breakfast Check Out hotel See Run way Side Seen to Visit Manikaran, Manikaran, is famous for its hot springs. Thousands of people take a holy dip in hot waters here. The water is so hot that dal, rice & vegetables etc. can be cooked in it. It is also a well known pilgrimage place for both Hindus & Sikhs. Ramchandra and Shiva temples besides a Gurudwara are there. 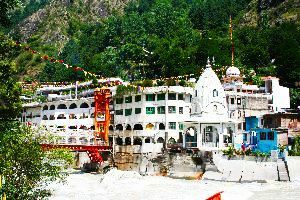 According to an old legend, Manikaran is connected with Lord Shiva and his divine consort, Parvati, who lost her ear rings here, which gave birth to hot waters on the bank of Parvati river Manikaran is a pilgrimage centre for Hindus and Sikhs. The Hindus believe that Manu recreated human life in Manikaran after the flood, making it a sacred area. It has many temples and a Gurudwara. There are temples of the Hindu deities Rama, Krishna, and Vishnu. The area is well known for its hot springs and its beautiful see Run Way Side Seen. to move Shimla , Shimla One of the most popular places to go to for shopping is at the Mall road in Shimla. This place is the shopping hub and commercial center of Shimla, local side seen the Shimla. All Local side seen, National Park Poney and Yak Ride and One can see the endless Himalayan One can find small Souvenirs and knick- knacks here along handicrafts and other artifacts that Shimla is famous for. You can buy the famous Himachali caps that are available in almost any Project, Pandoh dam local. The Ridge that lies along the famous Mall Road is the main venue of all the cultural activities in the town. Being the most popular shopping center in the city, Shimla Ridge links the most important commercial spots such as Lakkar Bazaar, The Mall, Scandal Point, Jakhoo Hill, among others. The Ridge is home to numerous Shimla's landmarks built in Neo-Gothic style that are a must for sightseeing in Shimla. The place is host to the famous Shimla Summer festival that goes on for 5 days and invites travelers from all corners of the world. The festival showcases different performances by local and national artists. Christ Church is the second oldest church in Northern India, Night Shimla. Morning After Breakfast Visit. Kufri is famous for its Himalayan Panorama from Kufri, explore the various places in and around Shimla. Lying just 24 km from Shimla Mall Road, Shilon Bagh houses outstanding resorts. From here you can access easily a fabulous tourist destination Kufri, situated at (2,633 meters in height) 16 km far from Shimla. The region is an epitome of serenity and tranquility that embraces the most pristine and breathtaking environs. The region is highly visited for its awe-inspiring beauty that is the love of every backpacker who wishes to rejoice amidst the most natural environs of Shimla. Apart from this, the region offers some of the finest accommodation facilities to travelers to make sure they enjoy the most empyrean luxury and comfort. Another tourist attraction Jakhu Hill is located just 2 km away from Shimla. 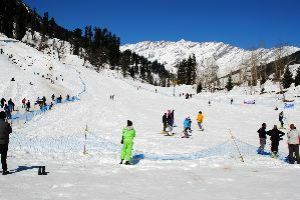 Lying at a height of 8000 ft, Jakhu Hill has the highest peak of this hill station, offering an amusing view of Shimla and also the snow-clad Himalayas. The Jakhu Hill is also home to the famous Jakhu temple, which is located the hill comprises a large statue of Lord Hanuman that stands at an elevation of 2,455 m (8,000 feet) above sea level and is one of its kind to be situated at such great height. Dedicated to Lord Hanuman, The temple is one of the most pious places in Shimla that is visited by numerous travelers. Shimla One of the most popular places to go to for shopping is at the Mall road in Shimla. This place is the shopping hub and commercial center of Shimla , local side seen the Shimla. All Local side seen , National Park Poney and Yak Ride and One can see the endless Himalayan One can find small Souvenirs and knick- knacks here along handicrafts and other artifacts that Shimla is famous for. You can buy the famous Himachali caps that are available in almost any Project, Pandoh dam local. The Ridge that lies along the famous Mall Road is the main venue of all the cultural activities in the town. Being the most popular shopping center in the city, Shimla Ridge links the most important commercial spots such as Lakkar Bazaar, The Mall, Scandal Point, Jakhu Hill, among others. The Ridge is home to numerous Shimla's landmarks built in Neo-Gothic style that are a must for sightseeing in Shimla. The place is host to the famous Shimla Summer festival that goes on for 5 days and invites travelers from all corners of the world. The festival showcases different performances by local and national artists. Christ Church is the second oldest church in Northern India. Morning After Breakfast Check Out Hotel see Run Way Side Seen To Drop Pathankot. Awsome experience..always recommend the same vendor and will try to use for same route..